‘Beauty comes from within’ – so the old saying goes. And if there is one company that has truly embraced the axiom – inside and out – it’s Lumity. Already known for its exquisitely rich and nutrient dense Facial Oil (which Robb Report discussed with celebrity facialist Nichola Joss), the brand is also working its magic on consumers’ insides with its nutritional supplements. Robb Report Australia sat down with Lumity’s creator, Dr Sara Palmer Hussey, to find out more about how the capsules work. What do you think is the biggest contributor to aging in the modern world? The biggest contributor to aging is probably chronic stress. A life without stress is unrealistic, but today more than ever, we live very fast, full lives, always on the go, bombarded with information, requests and obligations. People can contact us anytime and anywhere. This constant, low-grade stress plays havoc on our hormonal balance, disrupting sleep (a key tool in our anti-aging arsenal, thanks to its role in repair, rest and regeneration), disrupting mood, cognitive function, appetite and the healthy functioning of the entire body. It's absolutely vital to find ways to balance stress on a daily basis with relaxing activities. When it comes to beauty care, what is one of the biggest misconceptions among women and men? One of the biggest misconceptions in beauty is that skin requirements are different depending on skin type and area of the body. Fundamentally, skin has the same needs wherever it is and whatever issues it may currently have. When skin is supported with the right nutrients, both internally and topically, it will function optimally and resolve any issues or imbalances (eg. too oily, too dry, oversensitive, aging prematurely, eczema, rosacea, psoriasis, etc.) Sometimes harsh treatments that unbalance the skin's function can certainly exacerbate issues. Another misconception is that skincare has to be high-tech in order to be effective. We get mesmerised with marketing messages about nanotechnology and patented ingredients, while some of the best ingredients for skin have already been beautifully packaged by nature in ways that have a better affinity with the skin than synthetically-produced skincare. What changes can people start to see when taking a Lumity Beauty Supplement? Lumity supports many different processes in the body. These processes are the same in everyone, but where you see the results first is individually. 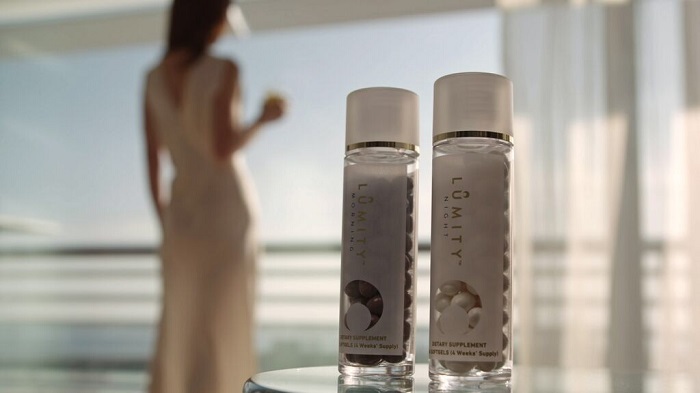 Lumity targets cellular energy production, so people will often see a lift in energy, greater clarity and mental focus and a reduction in energy slumps during the day. It strengthens the immune system, which is less apparent, so often people won't notice this at first until they look back over a few months of use and realise that they have not been ill since starting Lumity. By the second month, people start noticing an improvement in their skin, hair and nails with stronger growth and greater radiance - this is when the compliments start rolling in. Better sleep is also a frequently cited benefit. Lumity also supports inner health, and that’s not so easy to detect in a mirror or feel tangibly, but it works around the clock to support the body's defences against DNA damage, telomere shortening, insulin resistance, glycation, oxidative stress and inflammation. It's very simple. Sometimes beauty choices are overwhelming; beauty companies try to persuade us that we need a complicated many-stepped routine with a different product for each part of the body, as well as invasive treatments that can often do more harm than good. I have a two-step routine: I cleanse and I moisturise. I have formulated a multi-tasking cleanser, which removes make-up, deeply cleanses the skin, exfoliates very gently and also doubles as a revitalising, purifying and deeply nourishing mask when I have a bit more time to leave it on. Then I massage Lumity Skin Nutrients Facial Oil into clean skin. Both products are 100 per cent natural and are formulated with the most potent and nutritious plant oils, botanical extracts and essential oils. Do you have any beauty heroes? I love the aromatherapeutic power of essential oils. I have created unique blends for Lumity's skincare products using a balance of effects so that the facial oil is both revitalising and grounding, while the cleanser's scent clears the mind, strengthens and uplifts. I love using botanical oils and extracts and discovering their remarkable healing powers - more often than not nature is far cleverer than scientists at putting together the right combination and proportion of nutrients in the perfect package. I always take my lead from nature, whether it is studying how the body sustains balance and tends towards optimum health and how a supplement can best support the body's work, to studying plants and their specific properties and blending them to create the best support for the health of the skin.